Last weekend, my husband and I headed to Pittsburgh, just a couple of hours’ drive for us, for the Distant Worlds concert there. For the non-Maria and Draco obsessed, Distant Worlds is a touring philharmonic featuring music from the Final Fantasy video games. My husband has been wanting to go for years (and trying to get me to finish playing FFVII for just as long), so when I heard it was coming to Pittsburgh, I bought tickets for us. I had never been to Pittsburgh before, and I was really pleasantly surprised by the downtown Cultural District. We easily found cheap parking, everything was very walkable (indeed there were lots of people out and about), and I had trouble choosing where to eat dinner from so many tasty-sounding options. We had a great dinner at India Palace on 6th St. (good food, not at all crowded) and then walked over to the Benedum Center for the show. The Benedum is totally elegant and a beautiful concert hall and a great venue for a symphony, but it was a little at odds with the audience, most of whom looked like they were going to a con. I haven’t seen that much dyed hair all in one place in a while! Some people even cosplayed; there were several Marias. All the fandom was actually very refreshing; I am all for getting people who aren’t traditional “classical music fans” into a symphony. I did have to laugh a little at the two guys next to us who bought a third seat (~$60)for their coats; apparently their world view did not include a coat check. On our other side was a couple that brought the average age up a bit, and they only looked about 35; they were just some of the few dozen people there that looked like they might not have seen a chocobo before. I wonder if they were secret FF fans, or simply trying to use season tickets. 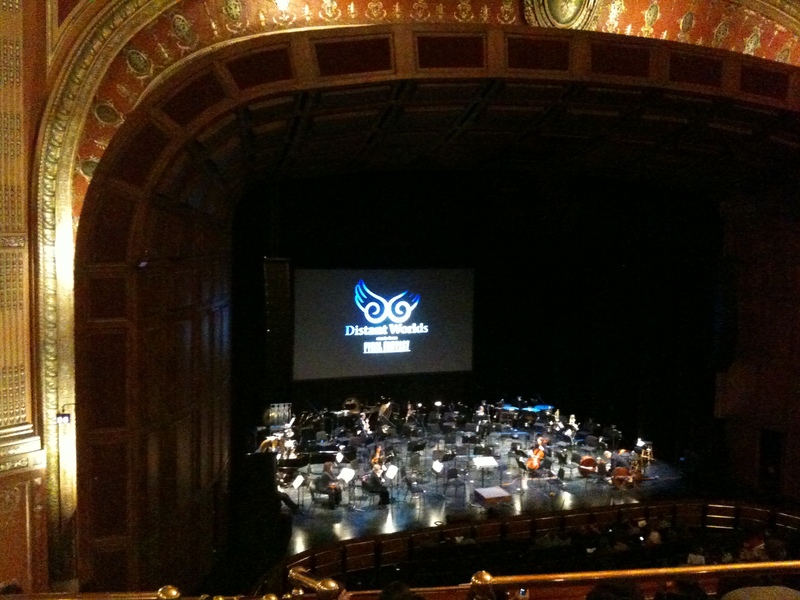 Overall, it was a totally awesome experience and I would highly recommend seeing Distant Worlds if you are a FF fan, or even just a fan of great orchestral music. They are visiting lots of cities all across the US and around the world. And next year will be the 25th anniversary tour, as well. Next Article They found Tatooine!